This weekend saw the second arm of the 2018-2019 Final Fantasy 14 Fan Festival. The event took place in Paris, France, celebrating the MMO game's community and offering up more information about what's next. This year's Fan Fest run is important because there's a new expansion for Final Fantasy 14 coming this year. Shadowbringers sees the Warrior of Light—the players—becoming the Warriors of Darkness as they take on the threat of the Garlean Empire. Shadowbringers is coming to PC and PlayStation 4 on July 2. This weekend saw announcements that referenced other games and characters within the Final Fantasy series. 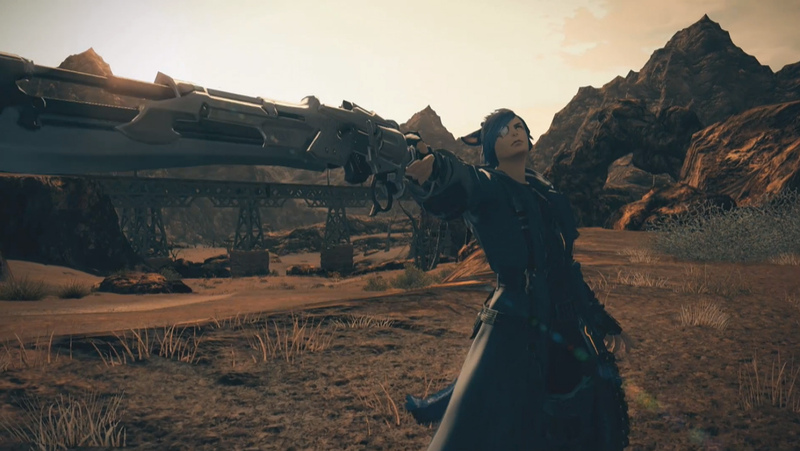 The new job, Gunbreaker, is patterned after Final Fantasy 8 protagonist Squall Leonhart and his rival Seifer Almasy, tanking for the party while wielding a cool gunblade. The new race for the expansion is the Viera, a race from Ivalice the world of Final Fantasy 12, Final Fantasy Tactics, and Final Fantasy Tactics Advance. There's also an upcoming collaboration with Final Fantasy 15, with players being able to fight alongside that's game's hero Noctis for an undisclosed number of quests. The final reward will be Final Fantasy 14's first four-player mount, a version of Final Fantasy 15's Regalia. None of this is particularly new to Final Fantasy 14. The game has also been a grab bag of past Final Fantasy games. Its setting is a mix of mythical fantasy, pseudo steampunk technology, and ancient futuretech that allows the dev team to draw from any Final Fantasy freely. Some references are just names and aesthetic ideas pulled from another game. The Garlean Empire is a reference to Garland, the antagonist of the first Final Fantasy, while the armor of their leaders evoke the Judges of Final Fantasy 12 and Tactics. The Empire also uses familiar Magitek Armor from Final Fantasy 6. The Crystal Tower in A Realm Reborn is based on the Final Fantasy 3 dungeon of the same name. You can gamble the night away at the Gold Saucer, the same pleasure palace from Final Fantasy 7. The gems that you can slot in your armor for additional stats? They're called Materia, like Final Fantasy 7. Many of the bosses are directly lifted and brought over to Final Fantasy 14 wholesale. In the current Stormblood expansion, the Omega lines of raids includes Final Fantasy's Chaos, Final Fantasy 5's Exdeath, and Final Fantasy 6's Phantom Train. The Primals, immortal creatures that form the building blocks of the world, are familiar Final Fantasy summons like Ifrit, Shiva, or Ramuh. There's even several aural callbacks within Final Fantasy 14's soundtrack, usually attached to the appearances of classic characters and bosses. Within the last expansion though, Square Enix has been taking it to another level. In Stormblood, the 24-man Alliance Raid series covered three raids: The Royal City of Rabanastre, The Ridorana Lighthouse, and The Orbonne Monastery. Avid Final Fantasy fans will note those as locations in Final Fantasy Tactics. The team went above and beyond, inviting Final Fantasy Tactics director Yasumi Matsuno to help craft the story of the raid, which recalls several Tactics characters. (Keita Amemiya, creator of the adult live-action series Garo, also helped with boss designs.) As a Tactics fan, being able to see the game get as much love as it did within Final Fantasy 14 is a treat. The Return to Ivalice raids is probably the most attention Tactics has gotten from Square Enix in years. That's sad, but at least it's something. 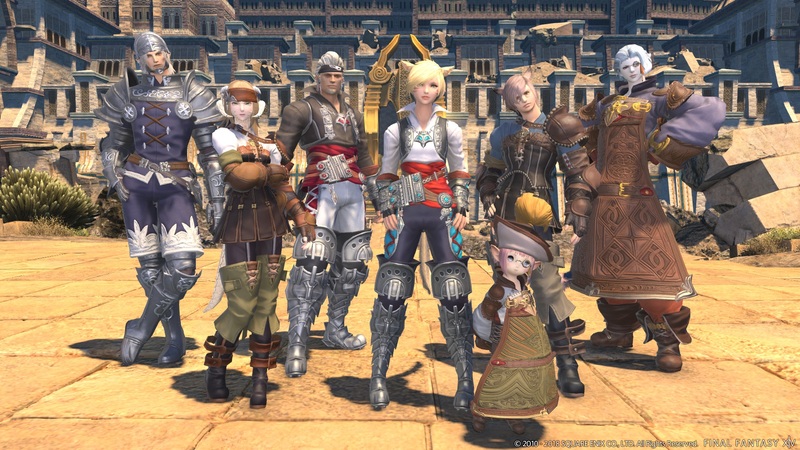 For Shadowbringers, Final Fantasy 14 director Naoki Yoshida announced that the expansion would have another guest creator. The Alliance Raid series will be called YoRHa: Dark Apocalypse, pulling directly from the fan-favorite Nier: Automata. We don't know the entire outlet of what to expect, but Nier: Automata director Yoko Taro and executive producer Yosuke Saito will be helping to craft the raids and their story. And like Return to Ivalice, the raid will probably come with sweet Nier-themed gear for your characters. This move opens Final Fantasy 14 up to the breadth of content within Square Enix. Nier: Automata isn't a Final Fantasy property. It's not even Final Fantasy adjacent. Kingdom Hearts only comes once every few years, while Final Fantasy 14 is essentially forever. Square Enix can continue to add in other properties, and the MMO is such a consistent financial success that the publisher can afford to pay old creators for another go-around with classic properties. The catalog that Square Enix can pull from stretches back to the first Dragon Quest in 1986. (Dragon Quest probably isn't making the jump over, as it has its own MMO in Dragon Quest 10.) That list includes franchises like SaGa, Mana, Valkyrie Profile, and Star Ocean, alongside classics like ActRaiser, Chrono Trigger, Xenogears, and Bravely Default. The possibilities are frankly endless. Imagine picking up a quest from Xenogears' Dr. Citan Uzuki, and fighting against the Xenogears-Id as a raid boss. Players could eventually join the valkyrie Lenneth on an adventure to free the souls of the dead or rebuild a broken land with the Master from ActRaiser. Flammie from Secret of Mana can end up as a mount. One of the many Star Ocean protagonists can find themselves shipwrecked on Eorzea. Hell, who's to say Sion and Volt from The Bouncer won't find their way in Final Fantasy 14? The team behind Final Fantasy 14 has worked hard to re-contextualize and change the characters and concepts that appear in the game so they feel like part of a cohesive whole. 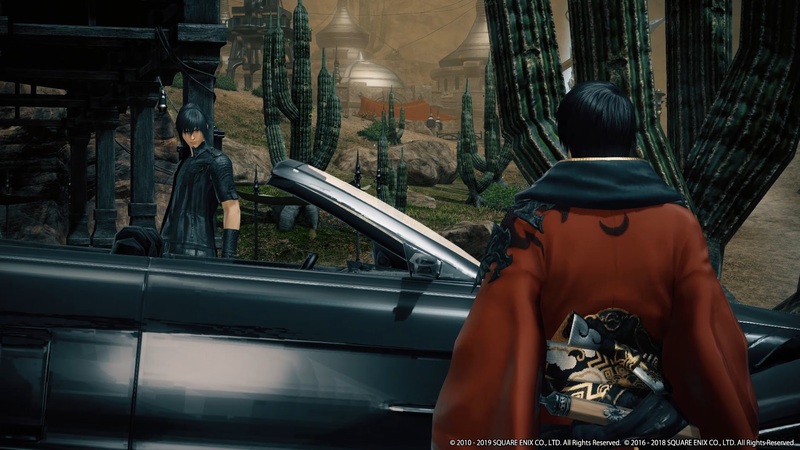 While mobile titles like Final Fantasy: Brave Exvius and Final Fantasy Dimensions also pull from all parts of Square Enix, cameos in Final Fantasy 14 often feel like more than just a guest appearance. Doma isn't just a reference to Final Fantasy 6, it's a kingdom lost to occupation that you help liberate over the course of an entire expansion. Bahamut isn't just one of the most popular summon characters, it's the focus of FF14's first raid, a world-ending creature you have to band together to destroy. The references are many, but they feel like they're all part Eorzea. Final Fantasy 14 treats the worlds it draws from with respect, and the final product is always worth the wait. So go crazy, Square Enix. Pull together everything into one grand crossover. There's fun to be had in playing around with the entire catalog. Creators can reconnect with past works, which might spark new games, while fans can see that some of their favorites are never truly forgotten. I know I won't be satisfied until I'm fighting Chrono Trigger's Lavos with an entire group, after finishing some quests in Bravely Default's Duchy of Eternia. Maybe once Final Fantasy 14 sunsets years from now, it'll be the game that truly stands up as the "most ambitious crossover event in history." Tagged with MMOs,	Opinions,	PC,	PlayStation 4,	Square Enix.